H.A. Hellyer is Fellow of the University of Warwick (UK) and Director of the Visionary Consultants Group (VCG) (Egypt/UK) a Muslim world – West consultancy. A United Nations ‘Global Expert’, Dr Hellyer’s research interests include Muslim world – West relations, the interaction between Islam and modernity, and the dynamics of Muslim Western communities. Formerly of the Brookings Institution (USA) with extensive policy experience with the British and American government establishments, Dr. Hellyer was previously Visiting Professor at the Law Department at the American University in Cairo (Egypt), and Visiting Fellow at the Institute of Strategic and International Studies (ISIS Malaysia). 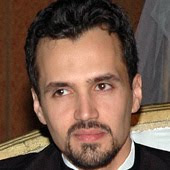 He received degrees in Law and International Political Economy from the University of Sheffield, before completing a multi-disciplinary PhD at the University of Warwick on the subject of Islam in Europe; he has also lived and travelled extensively in the Muslim world, studying with noted authorities in fiqh, kalam and tasawwuf. Widely published in academic journals and presses, he is a regular commentator in mediums such as the Guardian (UK), the Washington Post (USA), the National (UAE), the Daily Beast (USA) and speaks to forums such as the Organisation for Security and Co-operation in Europe (OSCE), the Azhar University in Cairo and the BBC Doha Debates. As a guest of HAKIM, Dr Hellyer will speak on his recent work “The Negotiation of Modernity through Tradition in Contemporary Muslim Intellectual Discourse: The Neo-Ghazalian, Attasian Perspective”, written with the Oxford University don and Malay ‘alim, Shaykh Dr Muhammad Afifi al-Akiti. Islamic Medicine, at core, is like what can be called an Integrative Medical Conceptual Framework (IMCF), or an Integrative Medical Principle (IMP), allowing it to systemically identify, appropriate and incorporate into its own medical theory and clinical practice, what is proven to be experientially and empirically good in all medical systems, modern or ancient, without compromising its own vision of what it means to be human and to be healthy. This Colloquium will try to flesh out this conceptualization in further detail in a way that people in the medical profession can find to be conceptually and empirically generative and fruitful. The revival of Islamic Medicine in the present context can provide a conceptually rich and yet practical medical alternative to modern medicine, a parallel medical pardigm that engages and interacts with the modern system and yet remain autonomous, with a great potential to critically and proactively identify, appropriate and integrate positive aspects of the modern system into its holistic vision and practice. Medical research is not only medical, empirical or clinical, but also philosophical, historical and cross-cultural (e.g., as in ethnomedicine), for there is so much of time-tested traditional medical methods, remedies and ideas that have been lost to our collective intellectual and cultural memory due to systemic, reductionist medical westernization, and hence, for the Islamic Medicine Research Program (IMRP) to move forward, historical and cross-cultural research is also important. This does not mean that all doctors and medical academics and professionls have to do the actual ardous research, but that all of them should be aware of such research as has been done, know how to access it and render it accessible to other practitioners and to their students and patients, and the lay public in general. "One commonality between the Eastern medical traditions and Prophetic medicine is their concept of holism, a view documented well over 1,000 years ago explaining the value of the mind-body-spirit connection—discussions modern science seriously begun to explore only in the past 20 years. Taking Chinese medicine as an example, other shared practices also demonstrate the similarities. Both these systems place emphasis on procedures such as cupping, herbal therapy, and dietary modification, with fundamental reliance on prevention, balance, and non-physical forces such as energy and prayer." 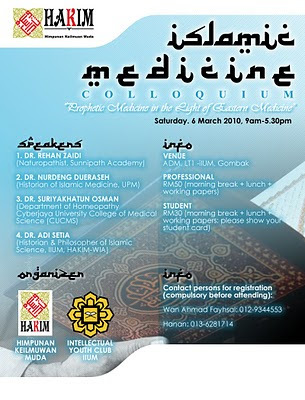 The colloquium draws on this time-tested, cosmopolitan heritage and invites the relevant parties to revive it in the context of a contemporary conceptual and empirical Islamic Medicine Research Program (IMRP), one major component of which is a systemic evidence-based reinvestigation of the clinical practices, remedies and therapies documented in the classical Islamic medical texts, including Tibb Nabawi texts, and another of which is a systemic critical survey of contemporary medical approaches from East & West, including indigenous ethnomedical oral traditions, which are in accord for the most part with Islamic medical philosophy and axiology, e.g., naturopathy, homeopathy, kampo, acupuncture, food therapy, sleep therapy, indigenous ethnomedical traditions, etc., even aspects of modern western secular allopathic and technological approaches that can be critically integrated into the Islamic Medical framework. 3. Dr Suriyakhatun Osman ( Department of Homeopathy Cyberjaya University College of Medical Science (CUCMS) "Homeopathy: God's gift to mankind"
8.00 am—9.00 am: Arrival of participants & Registration. 9.00 am—9.30 am: Welcoming speech by Dr. Farid Shahran, HAKIM Chairman. 9.30 am—10.30 am: International Keynote Talk & Presentation by Dr. Rehan Zaidi (naturopathist), Sunnipath Academy. 10.30 am—11.00 am: Q/A session. 11.00 am—11.30 am: Light refreshments break & networking session. 12.30 noon—1.00 pm: Q/A session. 1.00 pm—2.00 pm: Lunch, Zuhr solat & networking. Dr. Nurdeng Dueraseh (historian of Islamic Medicine). Dr. Adi Setia (historian & philosopher of Islamic Science). Mr. Fayhsal (postgraduate researcher/forum moderator). 3.45 pm—4.50 pm: Q/A & Dialogue Session. 4.50 pm—5.30 pm: ‘Asr solat, adjournment & post-colloquium networking.